I have been promising a reveal of my master bedroom for some time now. The delay is several things of which I am sure you don't want to hear all my excuses, however the main one is I have simply run out of money to complete the room. The main part such as the shutters behind the bed, side tables and bed linen, are now in place so I thought I had better post an update. 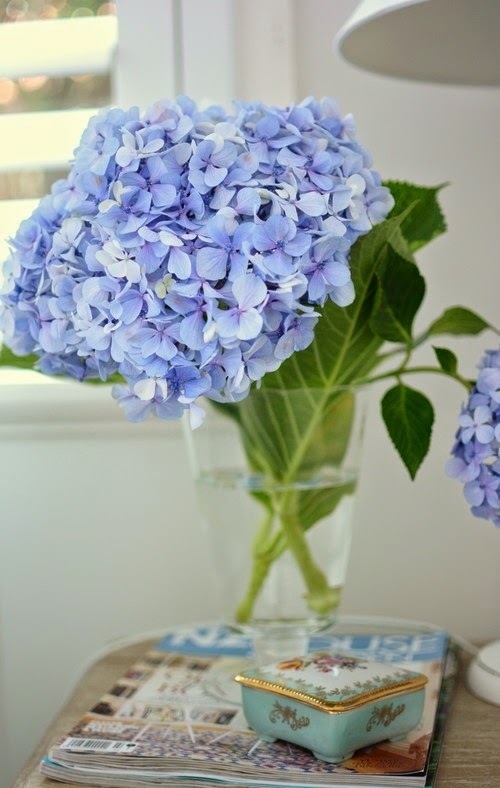 I am using the excuse of a design blogger in that I see so much inspiration around the web, I sometimes find it hard to make a decision as to the style I want in my cottage. Three years ago my bedroom had a distinct French, Cottage look, last year I decided that I was bored and started to look for new ideas. 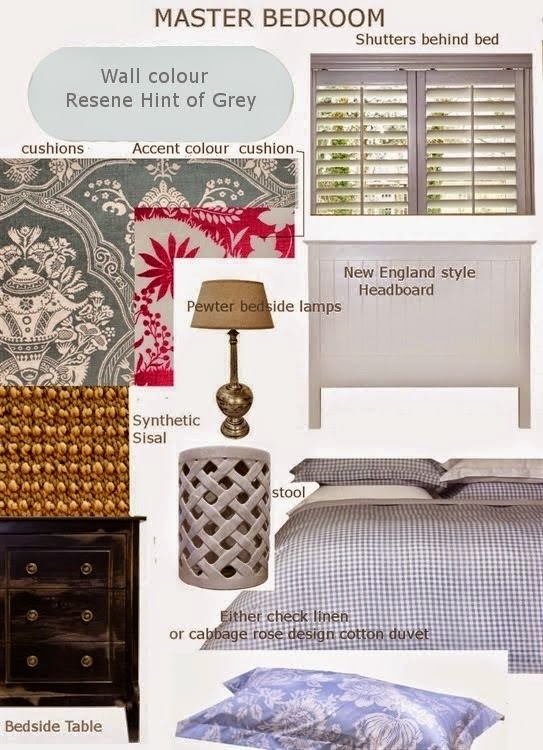 Originally I wanted to retain the French style, however a little less cottage and a little more grown up and included plans for an ornate, French headboard. However, as I decided to move my bed against the window, I soon realised that a large, ornate headboard was just not going to work. 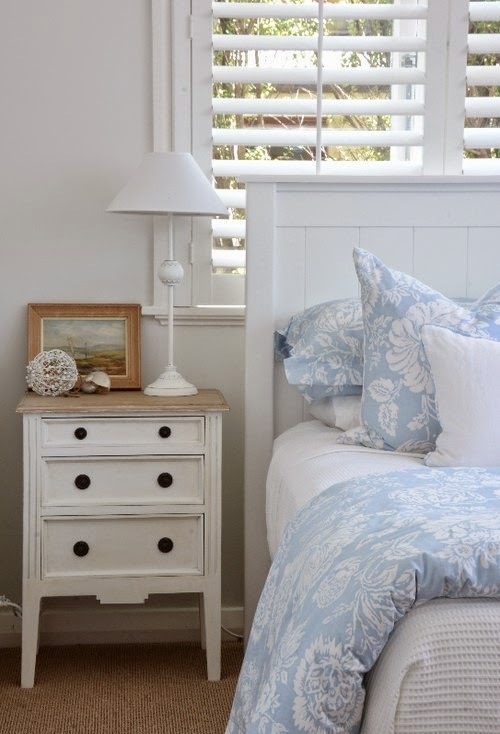 Meanwhile, I found myself drawn to the relaxed, Hamptons look and as my house seemed to be evolving towards this style, I had a change of mind and wrote about in a post, Blue and White Hamptons/Coastal style. I have made a few minor changes to my original design below, however most of the items are the same or similar. The sudden change of plan came about when I decided my bed would be better moved in front of the side window. Normally, I would never advise placing a bed against a window unless you have no choice. However for me it was about an easier route to the en suite. previously I had to manoeuvre around the bed in the dark, with the new layout it is now more or less a straight line. 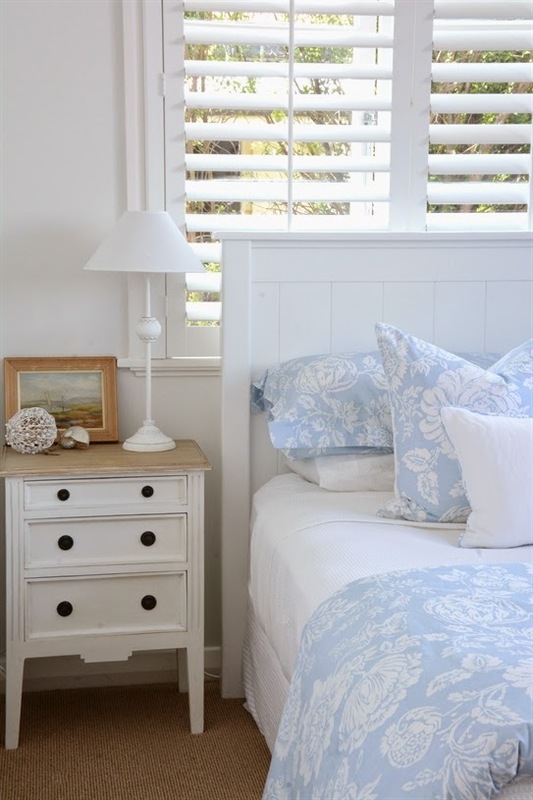 Placing the bed in front of the window I decided it would be better to have something solid behind such as a wooden headboard and shutters. 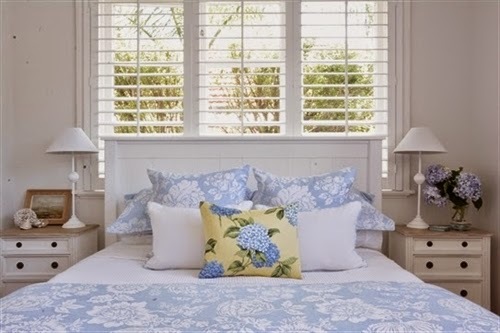 Shutters would also allow a breeze to flow through the room in the summer, help insulate in winter and provide privacy. 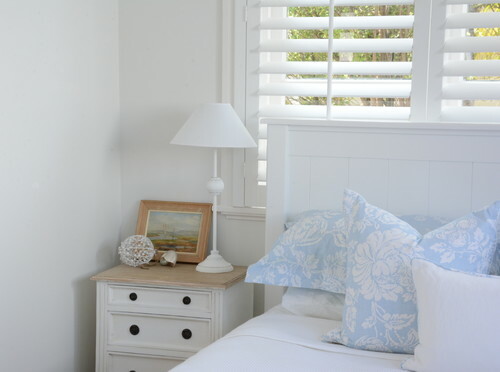 After a lot of research on available shutters in New Zealand, I decided to use Brightshine as I had previously purchased their white wooden blinds and found they were a great company to deal with. 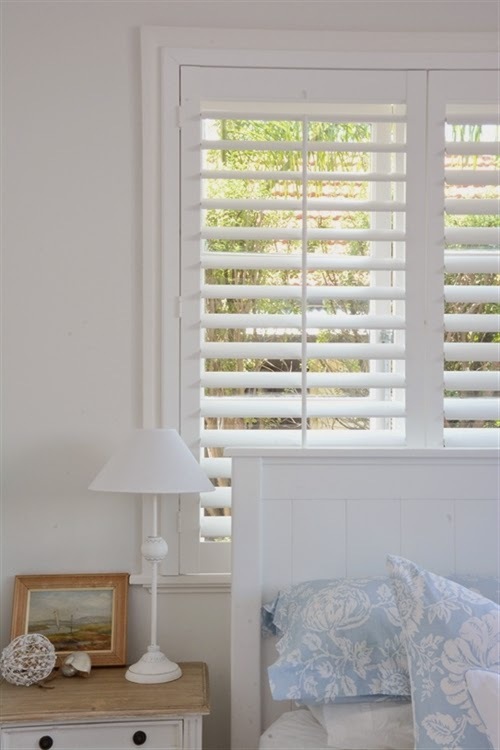 There is an 8 week wait with 50% deposit for shutters as they are made overseas, however this gave me time to save the balance. 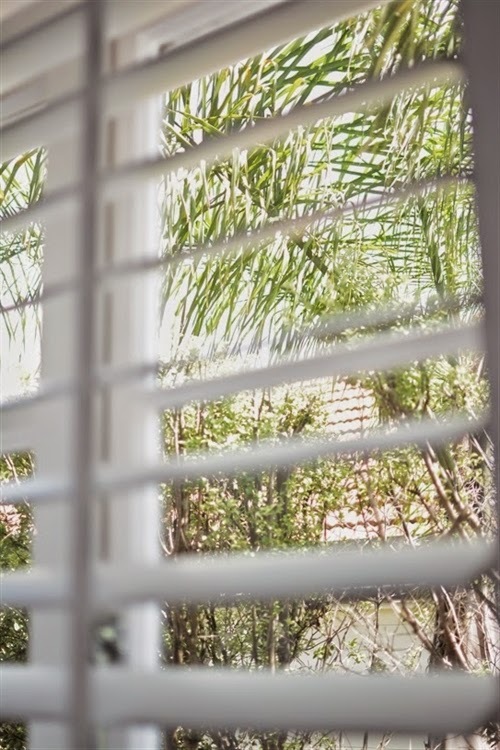 If you are ordering wide, wooden blinds as a cheaper option to shutters, they have their own manufacturing premises in Onehunga and they will make them up usually within 10 days or less. The most important thing is they oversee their product manufacturing and cover it with a replacement guarantee if anything is wrong. 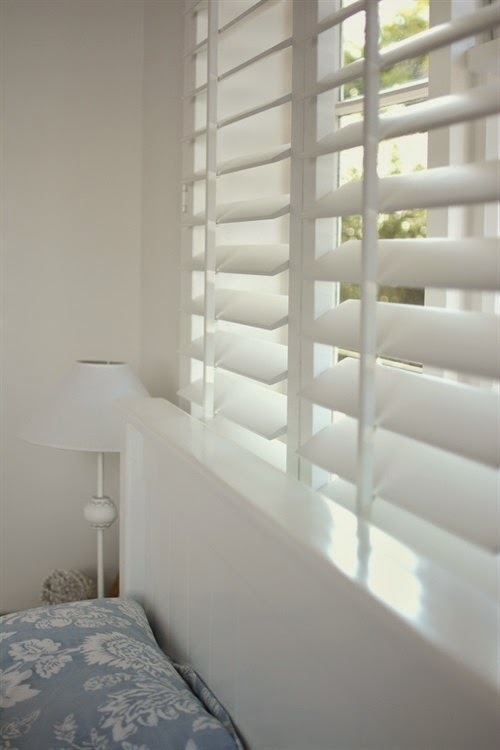 They have now installed three sets of wooden blinds and two sets of shutters in my home and all have been perfect. My personal experience of this company has been great products and excellent service. Above: For a traditional look, I chose shutters with a central bar for opening and closing, as opposed to the hand tilt ones in my kitchen, although I kept the same size blades for continuity. For my headboard, I chose solid wood, tongue and groove in a New England style. I purchased it on line through Trademe and got an excellent deal for NZ$259 from a really nice gentleman who hand crafts furniture at the back of his house in Kumeu... I have his email for anyone interested. 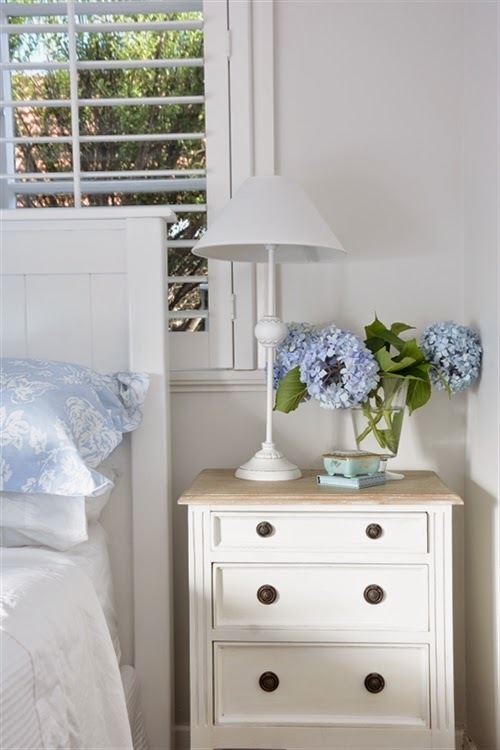 I had originally decided on black bedside tables, however I thought they may be too much of a contrast and opted for an antique white finish. 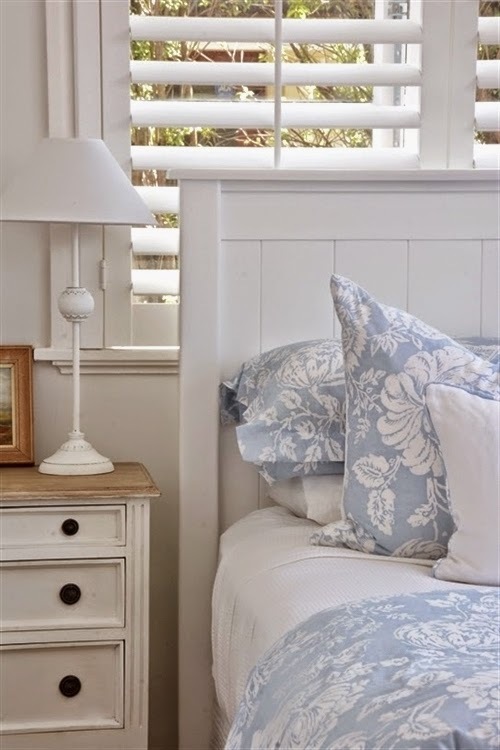 I had to give them one coat of pure white chalk paint to match the white of the shutters and bed. 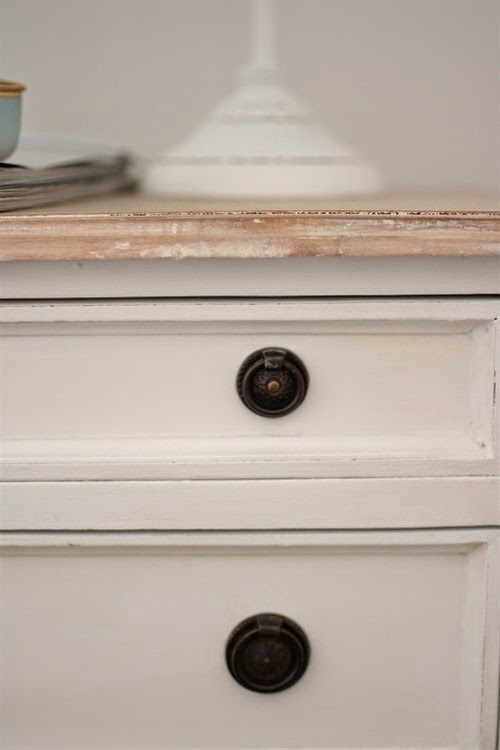 They do deviate a little from coastal style as they are more Gustavian looking, but I love the fact they have three storage drawers. I have still to purchase new lamps, meanwhile I switched the previous shades in beige, to some white ones I had stored away...By the way, these pretty French style lamps will be for sale when I replace them if anyone is interested. The side tables were purchased through Curtainalia & Bel Cuscino in Epsom. 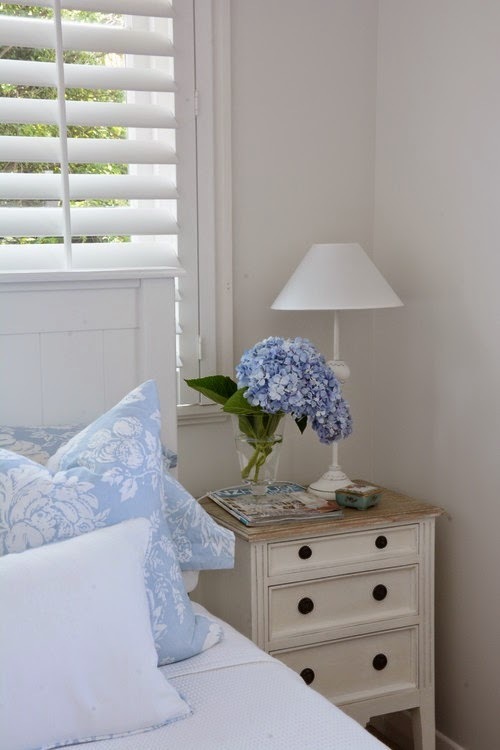 The bedlinen is Cabbage Rose, blue from Household Linens. The cushions were made by Kaye at Curtainalia & Bel Cuscino including the two large 55cm ones, cleverly created from one pillowcase that matched the duvet cover. There is still accessories, artwork and a reading corner to finish, the art I will be producing myself, I would also like some beach photography in black and white. My reading corner will require furniture and I am aware I need to introduce more texture. I Would love to hear your feed back, good or bad and maybe some ideas for the bedside lamps. I do love the pewter ones in the design board above, with different shades of course, but then again, I was thinking something in blue ceramic might be nice...decisions...decisions! Oh Lee - everything looks beautiful - I LOVE the blues !!! Your end tables are gorgeous too ! Your bedroom is looking lovely. Well done. I'm finally ordering the curtains for my bedroom next week. Yay! Then i will be looking for more bedding and cushions. Thanks Jane, what colour did you decide on for your curtains in the end? The shopping for final touches is fun, although I have run out of money. However, I got a gorgeous white, pinneaple yesterday from, of all places, Kmart. It is gorgeous and very detailed and the lid comes off, it looks lovely by my side of the bed. Once I have the lamps and art I will do another update on the room. It isn't quite finished yet. I have decided I might take a beach photo myself and have it blown up as they are very expensive to buy. So pretty, I love the color scheme and your fabric choices are wonderful. Thanks tons for linking to Inspire Me. Thanks Jane, it all takes time and money but it is coming together although I plan to change the bedside lamps. Bedding and cushions can cost considerably, I get my cushions made up by Kaye at Curtainalia & Bel Cuscino, she is very reasonable and they are gorgeous. She actually does curtains and blinds too. Would love to see your room when it is finished. Really nice, so relaxing now. 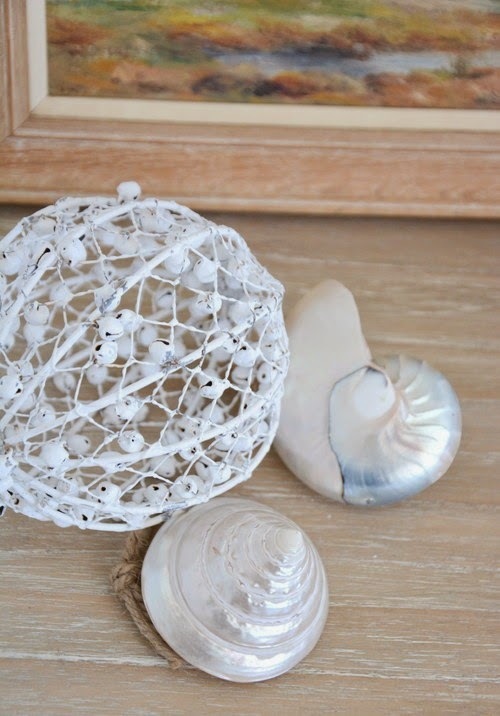 I actually like your table lamps, how about changing just the shades in to some nice fabric (and different shape)? (Stripes perhaps, blue and white or wide grey/beige and white to add some drama and texture). I love the idea of ceramic blue lamps but they're usually quite large and might be too big for your space. It's so pretty and fresh, Lee like a breath of fresh air. Thank you Kim, yes it is very summery and fresh. I am not sure how I will change the bedlinen for winter but probably go for soft grey linens and still keep a little blue accent colour.